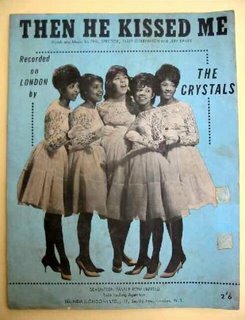 The Crystals/Phil Spector - "Then He Kissed Me"
When that immortal chord progression and timpani roll kicks in, it is immediately recognizable. "Then He Kissed Me" is, quite simply, one of the greatest songs of all the time; as well as one of the most ripped off songs of all time -- that fabled chord-progression being the source of much musical pilfering. Its DNA can even be detected in Joy Division's greatest song, "Love Will Tear Us Apart," and, if you disagree, get your damn hearing checked. 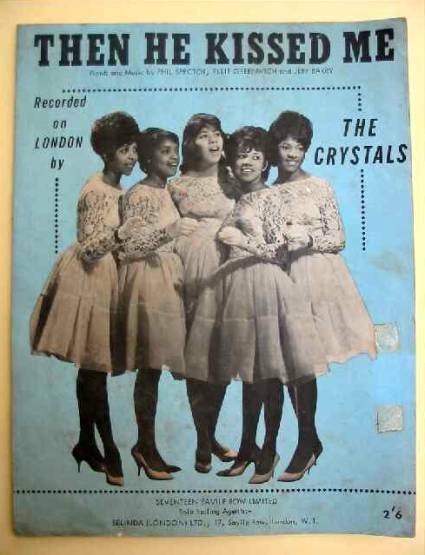 Although this song was written by the songwriting trio Ellie Greenwich/Jeff Barry/Phil Spector (also responsible for the band's hit songs "Da Doo Run Run" and "He's A Rebel"), the Crystals sang this song like it wasn't meant for anyone else in the world. La La Brooks' lead vocals sounded simultaneously fragile and steadfast. Spector decided to give The Crystals this song only after La La Brooks had been instated as the group's lead vocalist. Beyond the group's soaring vocal performance, this song is one of the finest examples of Spector's "Wall-of-Sound" production technique. In fact, some would argue that this was the first time that he truly got his sound crystallized (no pun intended). The before-mentioned timpani was played along-side a typical drumset to create that big, rolling percussion sound he favored. Every instrument - guitar, bass, strings, drums, and vocals - was wrapped in a cocoon of reverb. This resulted in the dense echo effect on the recording. Although this song has become an over-played oldie that you'll hear at an abundance of weddings, it still has lost very little of it's appeal and power over the last 40 years. You can hear obvious strains of its influence in an over-whelming amount of songs over the last four decades - both in a melodic and production sense. The next time you hear some garage rock/indie-pop band bang out those old, familiar chords, don't roll your eyes - they're probably just paying homage. Well, what a pleasant surprise to come across today. The debut solo album from Thom Yorke, a man who fronts a band you may have heard of called Radiohead. It's a nice little holdover until the next full-group album, which is supposed to be released later this year, or early next year, or in 2010, or never, I don't know. 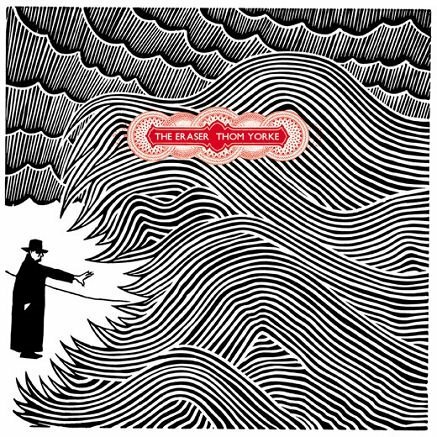 So here are some quick thoughts after my first listen: If you told someone this was a Radiohead album, they would believe you, obviously, because it has Thom's unmistakable voice. But this isn't Radiohead. It's something Thom did with Radiohead's own George Martin, Nigel Godrich. It has that glitchy, broken electronic sound the band developed on Kid A and Amnesiac, and again on parts of Hail to the Thief. I can already tell there are layers upon layers of sounds, but at the same time, it sounds pretty simple. I actually had pretty low expectations for this record. I thought it would be much weirder and more difficult than it is. But I found it rather enjoyable the first time through. I can't imagine fans of the Yorkier side of Radiohead not liking this. From what I've heard of the new Radiohead stuff (see an earlier Sawin' Blogs post for details), it would appear the two records have little in common. But we'll see. Well, the album's out on July 11. No album can be judged with just one listen, and I'm sure someone here at Sawin' Blogs will chime in with more before then. 2006 has given birth to quite a few wonderful albums, and we're not even halfway to 2007. I can't believe this is only half a year's worth of music. The following lists are in alphabetical order. I'll save a numerical ranking for December. As for singles, it's a toss up between Gnarls Barkley's "Crazy" and T.I. 's "What You Know", both of which are huge yet painfully simple. Nothing else comes close. Yet.